The inner workings of a restaurant extend far past the menu, and streamlined and responsive tools and systems are crucial for successfully running the business instead of running it into the ground. Thankfully, as we forge ahead into the future of digital technology, restaurant employees, as well as diners, are reaping the benefits of apps that hope to solve a lot of these issues, making a night out less about the planning, and more about the experience. Until recently, the daily experience of managing that menu, managing inventory, hiring a solid staff on the floor and in the kitchen, keeping staff schedules in check (and that’s just scratching the surface) tended to be handled on a desktop computer, or if the manager and owner are old school, in a notebook or on a bulletin board. With these seemingly outdated methods, things get lost in the shuffle, and what may have started out as a simple schedule change has turned into a scheduling fiasco. And the absence of technology doesn’t just cause problems on the staff side; diners who wish to see a menu ahead of time, or make a reservation at a restaurant last minute are brutally rebuffed by outdated pieces of technology or the total absence of technology in the restaurant, essentially being punished with extra-long wait times for not thinking to make a reservation weeks ahead of time. Planning ahead is something that’s not always ingrained in restaurant employees as they are, for the most part, hourly workers; meaning that they don’t have corporate emails to check in order to keep up with internal communications. As a result, many messages regarding hours, staff changes, menu changes, meetings, etc., tend to only spread via word of mouth or bulletin board postings, which can prove to be fairly unreliable, turning into a game of broken telephone. Jonathan Erwin, CEO of Red e App, realized this internal issue and did something about it by developing an app that employees can use in order to access messaging, documents and scheduling in real-time. Employees can receive notifications about weather delays, meeting announcements and menu specials, and can even access their schedules in order to swap shifts with co-workers, all from their mobile device. Red e App currently has a strong restaurant subscriber base of 35,000 out of the 92,000 total Red e App subscribers, showing that technology like this isn’t only seen as a major positive for the industry, it’s a necessity. 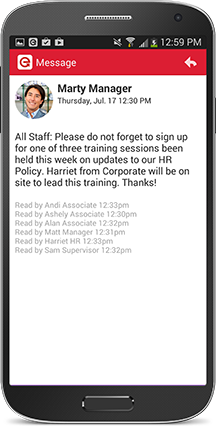 Having instant access to Red e App makes communication between management and employees fast and simple, and greatly decreases the possibility of the ever-popular excuse “Oh, I didn’t know I was working today, it wasn’t on the bulletin board!” Companies can also update Red e App with operation manuals, training information and restaurant policies to make sure that employees have access to these important documents, even after the doors of the restaurant have closed for the night. So what about those who are going to enjoy the fruits of a restaurant’s labor? Several years ago, the founder of NoWait, a guest app that gives diners the opportunity to check wait times at restaurants and put themselves on waiting lists before showing up, found himself trying to get a table for brunch, only to realize that each restaurant he went to had unreasonably long waits. While it’s only too easy to book a reservation at reservation-only restaurants, he realized there was no OpenTable-equivalent to casual dining outposts that don’t have reservation policies. When Ware Sykes joined the NoWait team in 2013, he embraced the opportunity to carry out the founders’ vision of giving people back an undervalued gift; their own time. NoWait’s accessibility to customers is a huge factor to its success. Being accessible from smartphones makes the app something that can be used at any time, from an hour before leaving for dinner to sitting in 20 minutes of traffic on the way there. As the first and only mobile network for casual-dining restaurants, NoWait is combining the ease of finding a favorite casual restaurant with eliminating the wait time, making for a free and relevant piece of technology that users benefit from right away. While Red e App appeals to the restaurant employees and NoWait to the consumers, Tipsi serves both fairly equally. 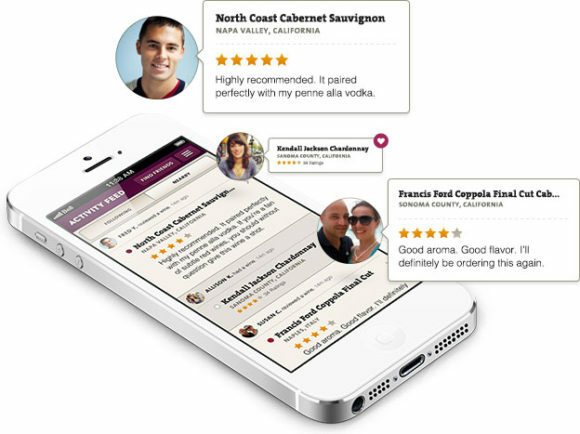 To give this app one definition wouldn’t be doing it true justice; it acts as a sommelier, a review site, a resource for up-to-date restaurant wine lists, a wine wish list, a food and wine pairing resource, among many other uses. Inspired by a night out during a bachelor party, Mike Bell developed an iPhone app that makes restaurant owners and diners the ‘users’ equally, by providing a consumer-facing app as well as a more industry-driven app. “Tipsi is an easy way to communicate wine lists to consumers, giving them the opportunity to come into a restaurant armed and ready with the sort of wine they want, or the right questions to ask,” says Bell. As an avid wine drinker and enthusiast, it became obvious to him that the one challenge that restaurants as well as wine-drinkers faced was the ability to reference an up-to-date wine list that wasn’t in PDF form online. By developing Tipsi, Bell has given consumers the necessary wine knowledge ahead of time, and sommeliers the ability to update their wine lists and provide food pairing suggestions through the app with a few simple button clicks. Additionally, Tipsi makes the job of the sommelier a more versatile one, giving them the opportunity to not just work 30 tables in one night, but to work 30 restaurants in one night as well. Currently, the app is fully up-and-running at the Chelsea location of Pierre Loti, but is accessible from hundreds of restaurants around New York City. Digital technology and mobile access is a crucial piece of a restaurant’s everyday functionality, whether they choose to accept it or not. By employing apps like NoWait, Red e App and Tipsi, something extraordinary is happening in the restaurant industry; A night out with no complications, no waiting drama, and maybe even a bottle of wine on the table when you arrive. Have we achieved restaurant perfection? Maybe not, but we’re well on our way there.